The Chevrolet Malibu is a superb midsize sedan. Fitting in the lineup just below the larger Impala, the Malibu competes with the Toyota Camry, Honda Accord, Nissan Altima, and Ford Fusion. Malibu blends a smooth ride with responsive handling, a quiet interior, effective crash performance and noteworthy build quality. For GM, it is a distinctly different level of car. Malibu is a midsize sedan with four-cylinder, V6, and hybrid gas-electric powertrains. We found the Malibu to be a smooth, comfortable sedan with plenty of power when equipped with the V6. It strikes a nice balance between well-controlled handling and an even ride. Overall, the new Malibu feels smooth and is pleasant to drive. The cabin is nicely designed, attractive, and everything is easy to operate, though there are some hard plastics that detract from an otherwise first-rate interior. The seats are comfortable, with plenty of front-seat room and generous space in the rear. Malibu offers value, with a lower purchase price, and fuel economy: EPA City/Highway ratings of 22/33 mpg for the four-cylinder with six-speed automatic, 17/26 mpg for the V6 engine and six-speed automatic, and 26/34 mpg for the Hybrid. We think it stands up well against the Toyota Camry and Honda Accord, the gold standards of midsize sedans. Choosing among them largely comes down to nitpicking, splitting hairs and personal preferences. The Camry and Accord may have an edge on resale value, but they’re also likely to come with higher price tags. In any case, we don’t see the gap between this Chevrolet and the imports that we used to see. Malibu, Camry and Accord are all superb midsize sedans. For 2010, the changes are relatively few. The 2.4-liter four-cylinder engine is E85-compatible, meaning it can operate on either gasoline or a mixture that includes up to 85 percent ethanol. The six-speed automatic is standard with the 1LT trim level, 17-inch Chrome Tech alloy wheels are standard with the 2LT, and driver’s-side power-adjustable lumbar support replaces manual adjustment on all models. Finally, there are some new colors. The Malibu was redesigned for the 2008 model year. 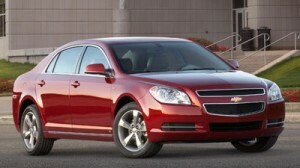 The 2010 Chevrolet Malibu range includes the LS ($21,825), 1LT ($22,715) 2LT ($25,175), and LTZ ($26,605), plus the Hybrid ($25,925). The Malibu LS comes with a 2.4-liter four-cylinder engine and four-speed automatic transmission. The base model also comes with electric power steering, to save drag on the engine, while the V6-powered models come with hydraulic power steering. Standard features in the LS include air conditioning, cloth upholstery, power height-adjustable driver’s seat with lumbar adjustment, cruise control, 60/40 split-folding rear seat, power windows, power mirrors, power locks, remote keyless entry, tilt/telescoping steering wheel, AM/FM/CD stereo with XM satellite radio and auxiliary input jack, outside temperature display, automatic headlights, one year of OnStar assistance with Turn-by-Turn navigation, and P215/55R17 tires on steel wheels. The Malibu LT model adds steering-wheel audio controls and floor mats, while the 2LT gets a leather-wrapped steering wheel, faux suede upholstery, heated front seats, six-way power-adjustable driver’s seat, universal garage-door opener, auto-dimming rearview mirror, Bluetooth connectivity and alloy wheels. The Malibu LTZ adds automatic climate control, leather upholstery, eight-way power driver’s seat, six-way power passenger’s seat, heated power mirrors, auto-dimming driver’s-side exterior mirror, iPod adapter, eight-speaker 210-watt stereo system, remote engine starting, fog lights, clear-lens LED taillamps and P225/50R18 tires on alloy wheels. The Hybrid comes in the 1LT-level of trim with special 16-inch low-rolling-resistance tires, plus automatic climate control and alloy wheels. Options include a power sunroof ($850), a dual-screen DVD rear entertainment system ($1,740), a power rear sunshade with manual side sunshades ($250), a 110-volt power outlet ($150), some paint upgrades, and additional convenience features. Safety features are comprehensive, with front, side and side-curtain airbags, tire-pressure monitoring, ABS with brake assist, and StabiliTrak electronic stability control with traction control. The Malibu’s long wheelbase provides ample interior room for occupants and a smooth, quiet ride. The Malibu makes good use of its space, and also has an attractive wheels-at-the-corners look that is substantial, yet clean and crisp. The body design is bold, long and sleek, with an especially appealing roofline that looks like it belongs on a luxury car. The bodysides are completely clean and uncluttered, and the twin round taillamps pay homage to the Corvette. The dual-port grille is a contemporary Chevrolet design cue, which gives the Malibu a distinctive look, and distinction is an important goal of the midsize sedan designer. Look closely and you’ll see tiny bowtie emblems imbedded in the headlights. The Malibu rides on a MacPherson strut front suspension and a multi-link rear suspension with front and rear stabilizer bars of varying diameters, depending upon the model. The Chevy Malibu cabin is beautifully done, with tight fits and no gaps. Everything is within arm’s reach and easy to operate. The instruments are very easy on the eyes. The most noticeable interior feature of the Malibu, other than the roominess front and rear, is the dual-cowl dashboard and instrument panel layout inspired by vintage Corvettes. This design is brought into the 21st century with wood and metallic trim and a very pleasing blue-on-white instrumentation graphic treatment that’s flooded with blue light at night. Less noticeable are thoughtful features such as ambient lighting. A feature associated with expensive luxury cars, and recently popularized by Mercedes and BMW, ambient lighting helps the driver and front passenger find secondary controls and items around the center console. A cubby on top of the dash is convenient for smaller items and is a very useful feature. Cloth, faux-suede and leather interior options are available. The standard interiors are monotone, but several two-tone interior combinations are available, including a dramatic black-and-saddle leather combination that’s very attractive. We found the leather seats in the LTZ quite comfortable. Piping in a contrasting tone dresses them up. The front bucket seats are somewhere between sumptuous and luscious in the way they look and the way they sit, and are very comfortable and supportive. The long wheelbase affords each occupant plenty of room, and there is ample headroom and legroom in the rear compartment for six-foot-plus passengers. The backs of the front seats are dished out to add knee room. The rear seatbacks flip down to provide a pass-through to the trunk. While the trunk has 15.1 cubic feet of cargo volume, the stylish rear pillars are pushed to the far back of the car, creating a small trunk opening that won’t accept large boxes. The cabin includes a dashtop storage bin, door cubbies, and seatback pockets, plus standard ambient lighting for the overhead console and door-pull pockets. We’ve never cared for roll-up sliding covers on center consoles due to their ability to attract crumbs, dust and debris. Overall, the Malibu interior is attractive and comfortable. The quality of the interior materials is good. It doesn’t bowl you over, nor does it reek of cheap plastic. We think the Malibu’s interior compares well to the cabin of the Honda Accord. In fact, it may be more attractive, though the material on the steering wheel hub and the hard plastic on the lower dash aren’t as nice. However, the Malibu has an attractive leather shift boot when the leather upholstery is chosen, and the Accord can’t make that claim. Every Malibu comes with XM satellite radio and the latest version of OnStar with Turn-by-Turn navigation. However, there’s no GPS navigation system, nor is there a back-up camera. Chevrolet says many people prefer to use their portable GPS units and relatively few want to pay for an OEM navigation system. We’ve heard that view from respectable drivers, but we prefer in-dash units. Big knobs and buttons and an elegant design make operating the audio and climate functions easy. In fact, we found it easier and less confusing to make adjustments in the Malibu than in a comparably equipped (without navigation) Honda Accord; the Honda seemed less intuitive and convenient. Unlike the Accord, the Malibu has the audio controls at the top, which is better because people tend to fiddle with the stereos more than the temperature controls. Remote starting is available. This lets the driver start the car by pressing a button on the key fob from the comfort of the house on wintry mornings, allowing the car to warm up while the driver sits inside sipping coffee. That same feature can be used with air conditioning on sweltering summer afternoons. We’ve driven all four versions of the Malibu, the four-cylinder four-speed automatic, the four-cylinder six-speed automatic, the hybrid, and the V6 six-speed automatic. The Malibu 2LT V6 we drove was very pleasant, indeed. The thoroughly modern V6 has 252 horsepower and delivers performance that is good, if not sparkling, and is certainly as much as most families will ever need. There is certainly no shortage of power or performance. With the V6, the six-speed automatic is quick to shift, up and down, smooth, lurch-free and quiet. The engine, which has nine different sound attenuators in the air intake system, sounds powerful and smooth. In fact, everything about the V6 is quiet and smooth. The suspension soaked up rough Mississippi farm roads with grace and competence, and kept the car straight and flat without a lot of pitching and body roll. On pockmarked Chicago streets, though, we did experience some jolts in the rear suspension, but they were pretty rough streets. The steering is reasonably quick and precise, but without much real road feel. And, for our preferences, the steering wheel is a bit too large in diameter; a smaller steering wheel would give a sportier feel. With the V6 engine, the driveline exhibits some torque-steer at full throttle. Stand on the gas when turning at low speed and you’ll feel a tug on the steering wheel. But, overall, the braking action and performance is on par with anything else in this class of vehicles and trustworthy in panic situations. The hybrid is considered a mild hybrid and uses a belt-alternator-starter, or BAS system, to stop and start the 2.4-liter four-cylinder engine when needed. It shuts down completely at stoplights, and can add 3-4 kilowatts, or about seven horsepower, to the gasoline engine’s output when needed. We found it works as advertised. The engine restarts immediately when you hit the throttle, and it does so smoothly. While the motor adds only seven horsepower, electric motors offer a lot of low-rpm torque, so the hybrid has a little more power and acceleration away from a stop than the base four-cylinder. The base engine is the Ecotec 2.4-liter. In base trim, it has a four-speed overdrive automatic transmission. It also has electric power steering, to save drag on the engine, which helps both fuel economy and performance, while the V6-powered models come with hydraulic power steering. The six-speed automatic is a much better choice with the four-cylinder engine. It increases fuel economy by three mpg on the highway, and its gear ratios allow the engine to operate in its power band more often. Plus, it comes with steering-wheel shift paddles that allow drivers to shift down to a lower gear manually when planning to pass. That’s a nice option, because the four-cylinder is no world beater, and is not as torquey or spritely as the four-cylinder engines offered by Honda or Nissan. The Chevrolet Malibu has all the size, room, features and conveniences a middle-of-the-market sedan needs to be competitive, and the fits and finishes inside and out are world-class. Chevrolet has indeed built a car we can’t ignore. We think the new Chevy Malibu stands up well to the best in its class, including the Toyota Camry and Honda Accord.